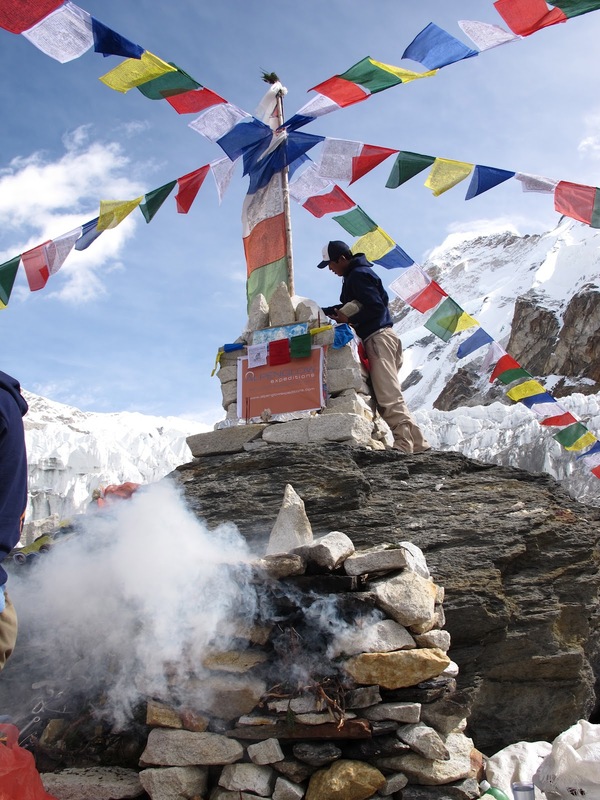 Central to the Buddhist religion and forming an integral part of any Nepalese or Tibetan expedition is the ‘Puja Ceremony’, during which the Sherpas pay homage to the mountain deity. The ceremony is the starting point for all Himalayan expeditions. The ceremony conducted by a Llama or Sherpa trained in conducting the Puja ceremony reads from a book of sacred prayers while sitting in front of a stone altar covered with offerings of cookies, chocolate bars, popcorn, rice and beer.. and whiskey. During this ceremony all climbers and equipment are blessed before beginning the ascent of the mountain. Marking the end of the formal ceremony, ‘tsampa’ (a roasted barley flour) is thrown into the air and rubbed on the faces of fellow team-mates and everyone is given a silk scarf as a symbol of being blessed. Our puja was conducted by one of our Sherpa’s, Pasang, who had been trained in conducting the puja ceremony at a local monestry. At one stage in the ceremony he began to chant louder in what appeared to be the climax of the puja as his well worn fingers followed the Cyrillic liturgy on the prayer book in front of his knees. He sat cross legged in front of the stone "stupa" (a sort of stone alter) which was covered from top to bottom in offerings flour, cakes, precious oils, cut up Bounty bars, Mars bars, Snickers bars… as well as an assortment of beverages including the finest whiskey as a sacrifice to the Mountain gods. Pasang’s intonation increased to an even higher, louder decibel as he threw his arms in the air releasing handfuls of tsampa flour as clouds of yellow dust high into the sky. The Sherpas, fully prepared for the move, eagerly followed his lead. An arc of grey 'dust' flew through the air and for one brief moment seemed suspended in time - a halo of flour superimposed over the omnipresent plume of spindrift coming off of Makalu. The ceremony lasted about 1.5 hours in total and ended formally with the flour throwing and informally with a ‘brunch’ which consisted of gorging ourselves on chocolate, and shots of whiskey. It was an extremely enjoyable and fun-filled yet richly symbolic morning. The end of the puja ceremony symbolised that we were officially allowed to begin our ascent of Makalu and that the appropriate prayers, blessings and sacrifices had been made. The whole expedition now seems even more 'real'. The 1.5 meter stone monument stands as a prime focal point in the middle of our 'tent city' giving the skyline a truly authentic look as 5-streams of prayer flags in the colors of red, green white, blue and yellow radiate from its core to various points in the Camp. 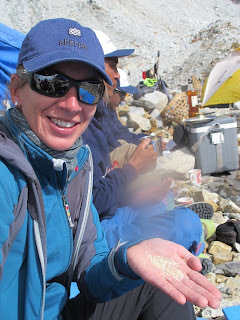 It felt "humbling" to be a part of something which is so clearly an integral part of the Sherpa tradition and Sherpa beliefs. There is a certain indescribable 'power' surrounding Himalayan expeditions that certainly puts into context the significance of such a ceremony. As I look out at the panorama from my tent - the stupa with its realms of multi-colored prayer flags flapping in the breeze against the clear blue sky and in the shadow of the mountain herself, I can not help but feel part of her spell, her magic, her power.